Rosie Ferguson is a typical American teenager. She is reckless, rebellious and emotionally distraught in her quest to find herself. Drugs and alcohol are hence her resorts to escape reality and float to a place where she doesn’t have to confront or resolve her problems. This tears apart Rosie’s mom, Elizabeth, and her stepfather. The more her parents reach out to help and curtail her derailed streak, the more she retaliates in the name of freedom. The fever pitch is intensified as Rosie’s mom battles her own psychiatric issues of depression, paranoia, and alcoholism. Parent and child feed fire to each other’s issues, resulting in a vicious cycle of emotional trauma. 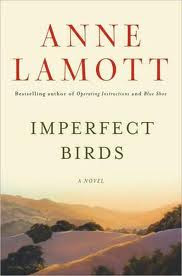 Lamott gives us a poignant vignette of these troubled lives. The book captures a few leaves out of their emotional journals, and the journeys they undertake to find peaceful, emotional stability. Anne Lamott is surely one of the most sensitive writers I have come across. She precisely touches on the deepest roots of an emotional problem and expresses them beautifully. So much so, that despite the seeming heaviness of the topics discussed in the book, she doesn’t bring out despair or revulsion, but only channels ways by which we can understand, empathize and exude compassion. She manages this by realistically portraying the characters and their lives, without adding any miraculous revelations and endings as stories are wont to be. She objectively brings out both the parents’ thought processes, anxiety and love, as well as the teenagers’ confusions and compulsion to defy and break out of their parent’s control. Grounded in psychological realism, she addresses only those aspects of a character’s personality and psyche that are malleable to change, while holding constant those that are beyond much transformation. Some characteristics, however problematic, are to be endured. This balance is beautifully established. I could connect well with all the characters, and relate to each of their angst, their deepest fears and insecurities. The helplessness and emotional trauma of both the mother and daughter were quite palpable. And as always, it pained me that two people who cared and loved each other so much, could also hurt one another deeply. So much of our happiness is reliant upon the bridge we can build between two minds. Yet how excruciatingly difficult it is for us to build such a bridge and sort out our issues. Under such circumstances, the love between parent and child, unfortunately only clouds and suffocates things more than clarify. The repeated cycle of betrayals that Rosie’s mom had to suffer really tugged at my heart. Ironically, I related to her better than I did with the daughter - especially to her fear of losing her daughter’s love, her dread of facing her wrath, and her constant rationalization to defend her daughter and hope for change. However, it is difficult to take sides, as obvious as it may seem in the beginning to censure the daughter. Just as in reality, no person is clearly “bad” or strictly wrong. The characters have a mix of black and white. Each has their problems, but their stash of underlying goodness and love keeps shining through in specks, even in the most bleakest of times. These are the specks to hold on to - to glean hope and faith that change and resolution can be brought about. The book is a psychologically perspicacious and sensitive discussion of the problems faced by most middle-aged parents with their difficult teenagers. The realism of the characters’ lives, and the insightful writing, help the reader garner empathy and hope.